The Flycycle neophyte is back in the saddle. This time, in the company of Babes. Jungle Babes, to be precise. Or would that make us Flycycle Babes since we’ve traded our hiking boots for a pair of cleated shoes? 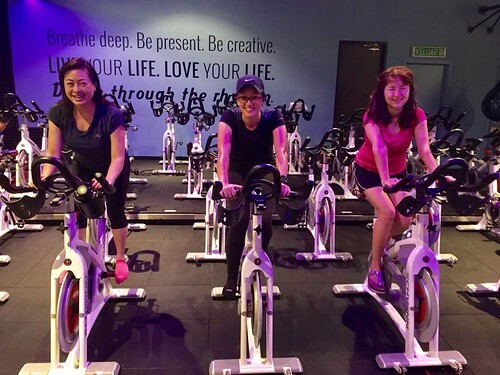 I must confess that I am grateful for the camaraderie because I struggle to find the joy in a spinning class. Oh they can throw in the loud music and the fancy moves, but at the end of the day, it is still akin to working out on a bike in the gym with a trainer who is whipping your behind to make you push harder. And that, I’m afraid, is just not fun at all. It’s not like rock climbing where I could feel the beauty of the movement and the grace of being able to execute a move smoothly. Neither do I keep going back because of a desire to get better at it. Although DH keeps trying to draw me out onto the road but I can’t say that that prospect is any more appealing. Every time I get into a class, I find myself counting down songs until we’re done. It is just a box I can tick to say, “Today, I worked out and it was hard.” It is cardio training for something else – like a train you take to get from point A to point B. So yes, it helps to know that the Babes are there waiting for me to come to class because I cannot imagine doing this by myself. In Barking Up the Wrong Tree, Eric Barker talks about boosting motivation by adding a game element to the challenge. I’ve been wondering how to add that element in since I can’t track distance and resistance level feels rather arbitrary. There are days when I feel physically depleted and the will to keep pacing is lacking. As I look at my fellow riders in awe, I wonder how they manage to double their pace when it is all I can do to push my pedals at this level of resistance. Then I remember what Paul Zientarski said, “Exercise in itself is not fun. It’s work.” And perhaps if we just embrace that fact and get down to business, we can stop griping about how tedious and painful this is.